This weekend I was, at last, able to add another walk to my Walks Diary. I started this diary in the New Year and it hasn’t been going well. A cocktail of endless family illnesses, snow, and building chaos meant lots of blank pages. We love to walk and if asked what they would most prefer to do for the day, our kids will often say, go for a walk in the countryside. Long may it last! I remember Little Owl once loudly wondering to me that she hadn’t had a picnic on a tree stump in a while. However, the silly thing we often do is go for a great walk and then say to ourselves something like, oh next time we’ll turn left there and do that extra loop down to the stream; or, that would have been a better place for the picnic; or, we should come back in spring when this place must be full of bluebells; and by the time we do the walk again, we’ve forgotten! Some of you also know my pursuit of simple, seasonal living as a defence against mental illness and some of the unhealthy aspects of modern life. I’d like our walks to reflect a natural rhythm: to walk where the flowers are blooming when they are blooming if you like. Anyway, at last, this weekend I could photocopy the OS map, mark our route with a coloured crayon and make notes. The walk was in the area around Hound Tor on Dartmoor, taking in Kitty Jay’s grave, Bowerman’s Nose, and the Hound Tor medieval settlement. Kitty Jay was a young maiden betrayed by her betrothed who then hanged herself. There are always flowers on her grave and it is said they are put here by a ghostly hand who won’t let her memory be forgotten. Poor old Bowerman was an 11th century hunter who disturbed a coven of witches and was turned into stone for his trouble. Dartmoor is cluttered with these sorts of stories and I love it. Clambering over rock-strewn hilltops, and then down into deep, dark, mossy lanes, Dartmoor is one of the oldest-feeling places I’ve ever been. Everything about it tingles with an ancient and almost other-worldy atmosphere, even on a bright sunny day in June. Funnily enough, it was the very real ruins of the medieval settlement nestled between Hound Tor and Greator Rocks that felt the most mysterious to me. It has the perfect vantage point, looking down the wooded valley towards Manaton. I could imagine lookouts posted on both sets of rocks to keep watch for marauders from the South and West. Originally Bronze Age, it was resettled around the 9th century. Now all that remains are a few gentle, overgrown mounds and piles of stones, perfect for hobbits. From up on Hound Tor it’s easier to see the intention in the layout, which sets it apart from the surrounding piles of rocks and mounds left by nature. Very little is known about the people who lived on Dartmoor in the Bronze Age. They seem so strange and distant, living before Hellenism and the post-Enlightenment paradigm of this age. How did they think and see the world? Recently the Woodland Trust and The National Trust undertook an archaeological dig at Wooston Castle, not far away in Fingle Woods. Wooston Castle is an Iron-Age hill fort in an unusual position, not up on a hill as is most often the case. You can read more about the dig here. I’m excited to hear the results when they come out. 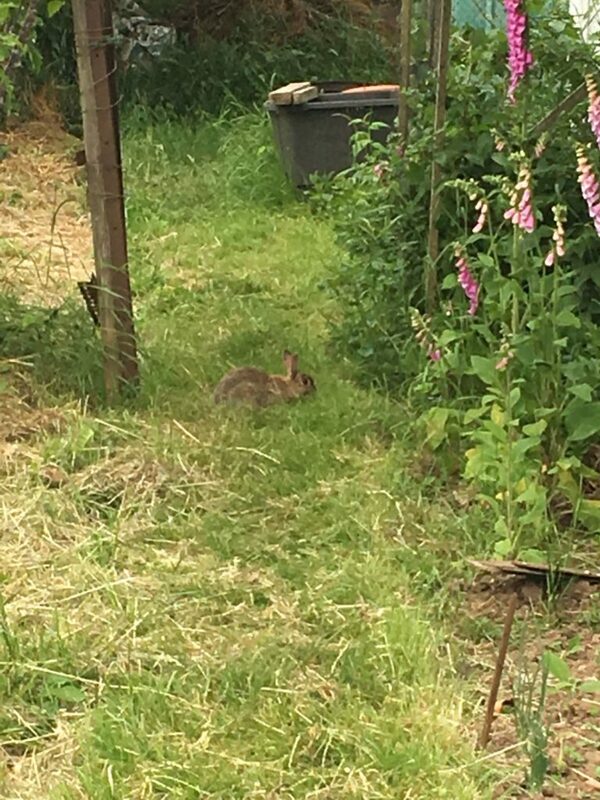 In other news, look who’s been hanging around the allotment! 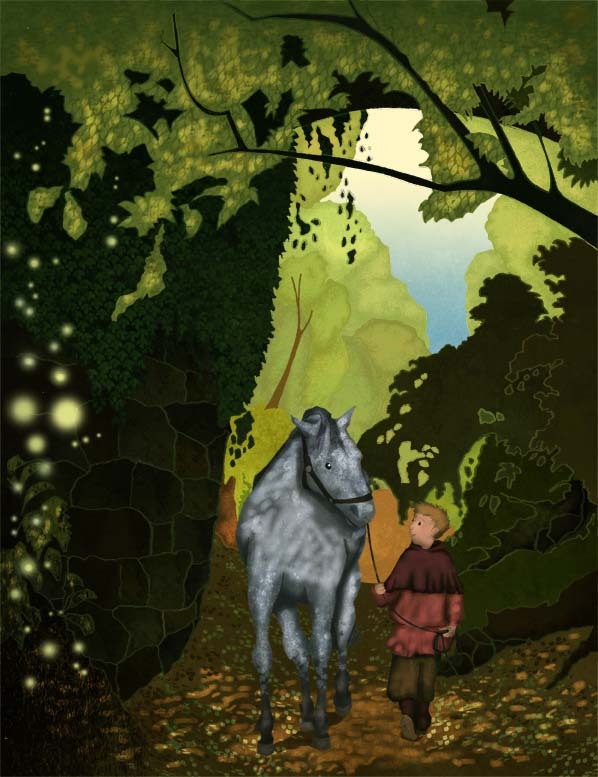 This entry was posted in Uncategorized and tagged 11th century, allotment, archeological dig, Bowerman, boy, children, childrens' book art, coven, Dartmoor, elves, fairies, Fingle Woods, flowers, folklore, grave, Greator, hanged, Hannah Foley, horse, Hound Tor, hunter, illustration, illustrator, kid lit art, kids, Kitty Jay, legends, magic, Manaton, medieval settlement, myths, National Trust, natural history, pixies, rabbits, stories, tales, trees, turned to stone, witches, woodland, woodland trust, Wooston Castle. Bookmark the permalink. Oh – mind what he/she finds to nibble or you’ll not be the beneficiary of your labours. Love reading your tales – informative & allowing me to enjoy my surroundings vicariously. That sense of history & heritage is very special isn’t it?? Ahh – that’s great! Yeah definitely – very special. There’s a lot of competition for these veggies. I’ve been spraying the broad beans with washing-up liquid because the black-fly have arrived – sigh.